While it would seem possible to live simply on good books, the Four of Us balance our lives with good food. The Big and Little Sister have learned to love Asian cuisine (and to use chopsticks) thanks to The Fusion Restaurant in Frankfort, Michigan. A few weeks ago Bobiesee, one of the Fusion's owners, told the girls that she overheard some customers talking about the project... the girls were giddy! We are glad that The Fusion Restaurant shares our love of good books and good food! 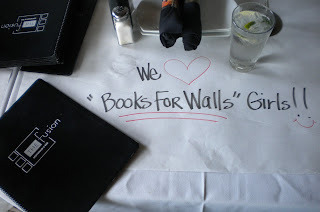 If you are in Frankfort make sure to stop by The Fusion to enjoy delectable food with an amazing view of Betsie Bay and be sure to tell Bobiesee the "Books for Walls Girls" say hi! The Mom's two cents about The Fusion: I LOVE the service.